When a Capricorn pairs up with another Capricorn, the relationship that results is one of stability and commitment to each other. Both partners are ambitious, patient, responsible and loyal. They both crave simple relationships with loyalty, and a prestigious lifestyle. Capricorns share similar tastes and values, are goal driven, ambitious and practical people; therefore when they go after a goal, Capricorns are basically unstoppable. Both Capricorns are fundamentally loyal and require a partner to whom they can fully commit and be faithful to. The main problem is getting this relationship to take off in the first place as both partners are reserved people and prefer not to take the initiative most of the time. Capricorns may seem aloof, emotionally detached and find it difficult to appropriately express emotions. Capricorns usually complain of being misunderstood by other signs. In a Capricorn-Capricorn relationship, that problem simply does not exist as both partners are born under the same sign, have the same needs in a relationship are ambitious and goal driven. There is, however, a difficulty in expressing emotions and as a result overtime, both partners may feel a lack of emotional connection. The Capricorn Male: The Capricorn man is very loyal, physical and passionate. He is a planner and does not usually “go with the flow”. Underneath his cold unemotional exterior lies a deep yearning for love but it somehow always eludes him as he does not trust easily. He is very faithful, and a patient partner. The Capricorn Female: The Capricorn woman is classy, conservative, loyal and practical. Like her male counterpart, on the outside, she seems not to give a hoot about love. Deep inside, however, it is another story as she is romantic and loving. She is also a bit traditional and so likes to be courted as a lady. She is smart and practical and likes to take charge of the relationship. 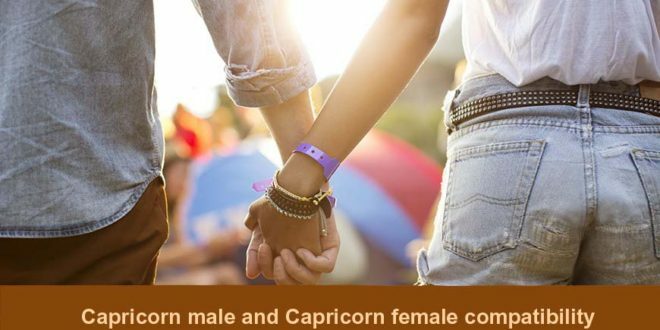 The Capricorn-Capricorn relationship is typically very stable and long lasting with both partners putting in major effort into making the relationship work. This match has been touted as “boring” as a result of the extreme similarity in desires of both partners and their seriousness. This is a match with a lot of long term potential. Also, as a result of both partners’ wishes to be in control of the relationship, there will be arguments and power struggles in the Capricorn-Capricorn relationship. Capricorns also are hard working to the point of neglecting other activities just to complete a project. Both partners understand the value of hard work daily and sometimes may negatively impact their lives. Capricorns are serious individuals who value productivity above all else. Risk-taking and public display of affections do not come naturally to Capricorns. This can lend itself to awkward situations where important projects are abandoned in favor of issues that Capricorn thinks are more important. Tags capricorn and capricorn friendship Capricorn and Capricorn Love Compatibility capricorn and capricorn sexually capricorn compatibility signs capricorn compatibility with capricorn capricorn man and capricorn woman attraction capricorn man and capricorn woman compatibility capricorn man and capricorn woman in bed capricorn man best match for marriage capricorn man capricorn woman differences Is Capricorn and Capricorn a good match?